See, hear and make calls with ease with the AT&T CL82407 deck 6.0 expandable Answering system with smart call Blocker and unsurpassed range. With this system, you can say goodbye to unwanted calls waking you up in the middle of the night or tying up the line. Robocalls are automatically blocked from ever ringing through-even the first time. You can also Permanently blacklist any number you want with one touch. 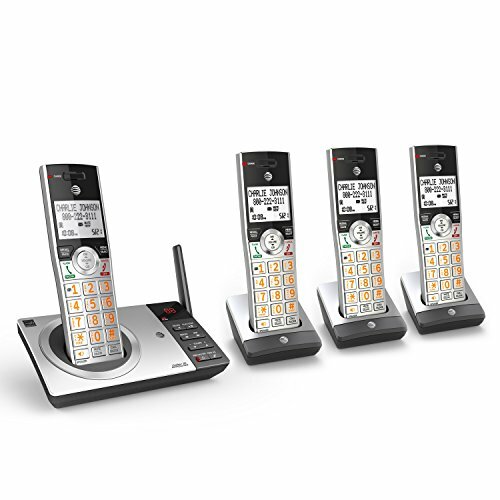 The AT&T CL82407 Answering system is a reliable cordless system that brings you long range, HD audio and extra features like caller ID announce and Push-to-Talk for effortless calls from any room in your home. Plus, the large buttons and extra-large screen make it easy to see and dial calls. Thanks to the built-in digital Answering system, can record up to 22 minutes of incoming messages, outgoing announcements, and memos to help you stay organized.